Looking for a night out that'll really float your boat? 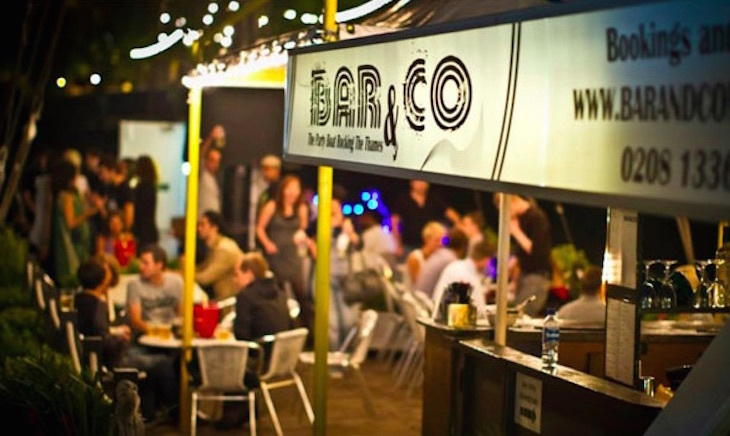 London's full of bars, pubs and cafes on boats, ships and barges, dotted along the River Thames and the city's canals. 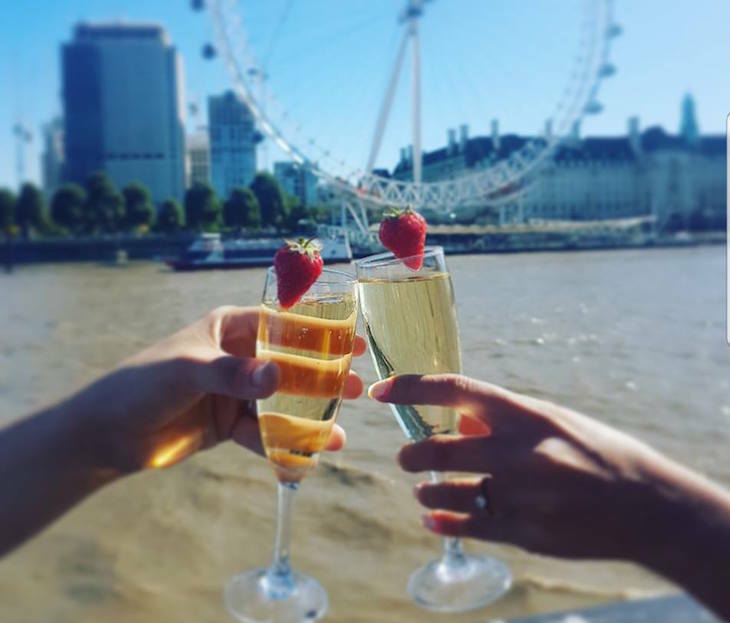 Whether it's a romantic date night or lively mates' date you're planning, take a look at these waterborne drinking dens. "We drink beer and we drink Cola, all aboard the Hispaniola"
We have no idea what that line is from — it's buried somewhere deep in our childhood, and Google's no help — but it goes through our mind every time we chug past R.S Hispaniola on a Charing Cross train on Hungerford Bridge. Once you're firmly on Embankment, wander down the gangway onto the smart navy and white vessel for multiple drinking — and eating — options. Afternoon tea and a pre-theatre dinner menu are available, but for us, it's an ideal spot for kicking back with a cocktail and watching the river traffic floating past. If the weather's decent, head to the Upper Deck and choose your poison from a lengthy drinks menu including cocktails, mocktails, champagne, wine, spirits and bottled and draught beers with food available also. There's much amusement to be had up here watching tourists on Hungerford Bridge waving at different tourists on the moving boats below, the boat captains honking their horns to whip their passengers even further into a holiday-induced frenzy. In adverse weather, head inside to the Pinkton Parlour, where the rose-tinted decor lives up to its name (a throwback, we suspect, to a former Benefit Cosmetics residency on the boat). As you can imagine, R.S. Hispaniola's prime position across the river from the London Eye makes it very in demand on New Year's Eve, and it plays up to the tourist crowd with a 'London Eye' cocktail, and South Bank Gin used as an ingredient in several cocktails. Tattershall Castle is R.S Hispaniola's raucous neighbour. 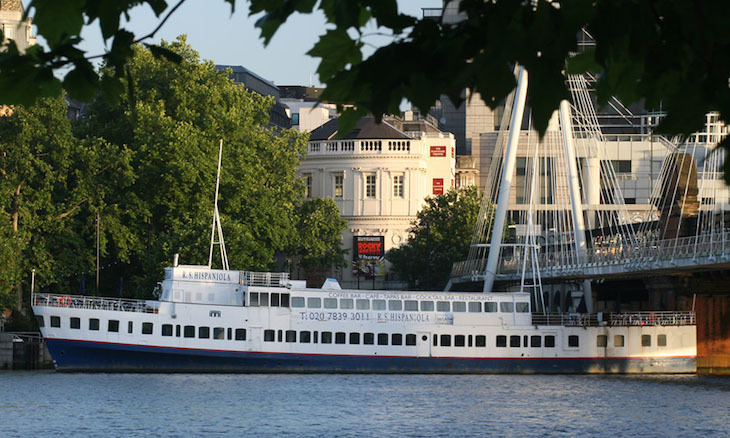 For every sophisticated evening of cocktails and sunsets the Hispaniola offers, Tattershall Castle tempts passers by on board with lively comedy nights, themed pub quizzes and sports match screenings, that tilted red and blue chimney a beacon to anyone looking for some fun. You can even get married here (easy on that bouquet throw though — soggy roses don't look quite as fetching). The boat itself has an interesting history — she was used as a passenger ferry on the Humber Estuary in the 1970s. 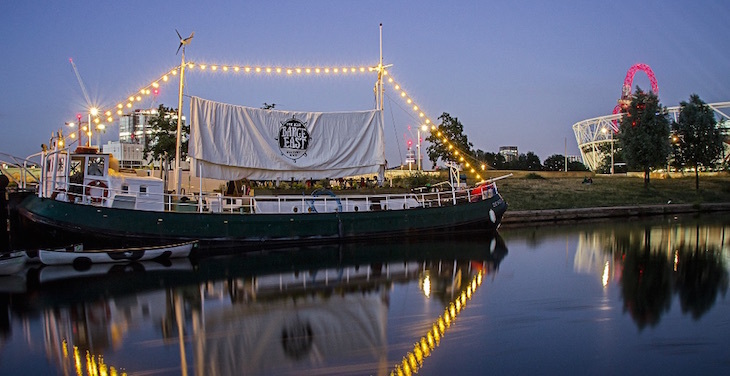 Her London debut was as a floating art gallery, before she realised that her true calling in life was serving up booze to all that sail in her. These days, gin is a prominent feature on the drinks menu, with at least 10 varieties available to mix and match with a selection of tonics. Spritz, spirits, wines, beer, ciders and cocktails combine to form a compelling reason to delay your return to dry land for as long as possible. Fish and chips is the specialist food, but the a la carte menu also offers everything from burgers to pies to lamb shanks. There's a separate kids' menu for sailors in training, and afternoon tea is also served. Definitely more of a pub than a bar, Tamesis Dock does a decent job of feeling like a characterful local boozer — as long as you're not looking for anything too traditional, and you've got your sea legs. 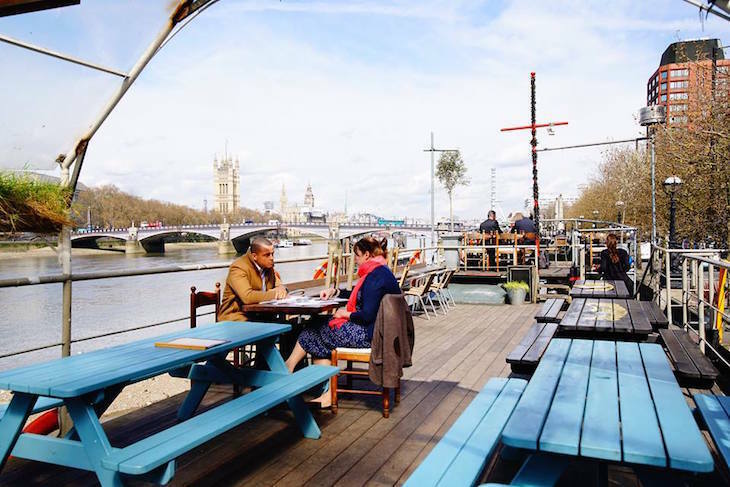 The converted 1930s Dutch barge has an eclectic collection of benches, tables and bar stools up on deck, and with views of the Houses of Parliament, it's a relaxing way to spend the afternoon. This being London, if the weather's not on your side, head inside, where you'll find the wooden bar and an eclectic range of decor, from traditional nautical bells and navigation maps to disco balls, pop art, and a chandelier made from glass bottles — but the small windows mean that the gentle rolling motion is the only hint you're on a boat. Descend the colourful stairs to our favourite part of the boat, a rather snug area full of charmingly mismatched leather sofas and bar stools. Much more boaty. We'd give this one a miss on nights when FC Barcelona are playing — it's the official home of Penya Blaugrana London, the London outpost of FC Barcelona's Supporters Club. Tennis, rugby and basketball are also shown regularly, so to avoid finding yourself on a floating sports bar, check the fixtures before you turn up. Beyond sport, Bar&Co is something of a party boat, with a bar, restaurant and nightclub packed onto the vessel, moored at Temple Pier. Up on deck there's a small bar, but most of the action takes place below deck, where there's a seating, dancing and DJ area for up to 130 people. Its elegant shape and fabric, sail-style signs always put us in mind of a pirate ship when we catch a glimpse of Barge East. 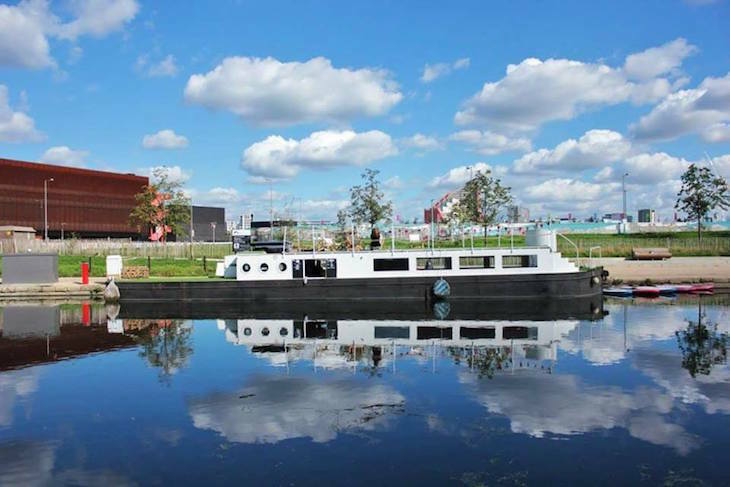 In reality, it's an old Dutch barge, but you get the feeling that magical things could happen on board, concocted up by the three childhood friends who bought the boat and opened Barge East. Admirably, many of the drinks are stocked from local east London suppliers. The East London Liquor Co's products are used in Barge East's cocktails, Truman's Brewery's beers appear on the beer list, intermingled with Dutch offerings as a nod to the vessel's heritage. Even the tea is sourced from the London Tea Co. For those looking for a teetotal night out, Dalston Sodas are the alternative to yet another warm orange juice. It's a predominantly outdoor affair, that aforementioned sail being erected as a canopy to stave off the London chill. Fairy lights trace the ship's outline, making for romantic reflections in the water on calm summer nights. 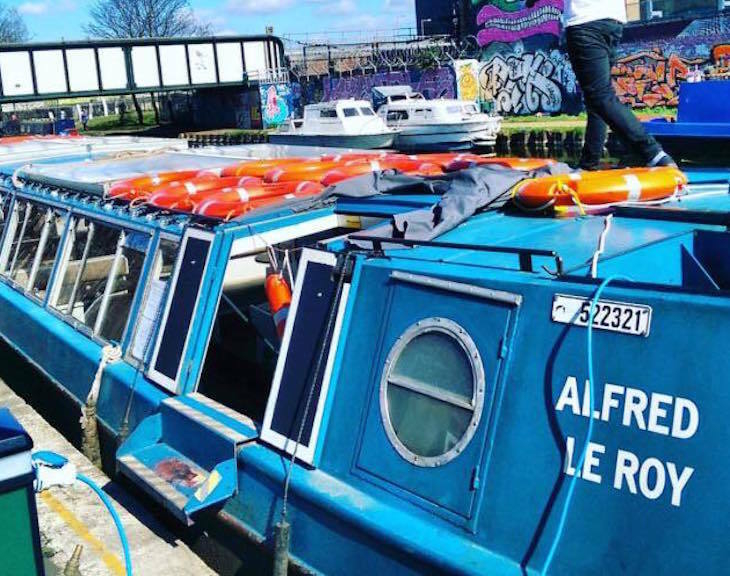 When it's not cruising the River Lee Navigation and east London canals, you'll find Alfred Le Roy moored up alongside Crate Brewery in Hackney Wick. The cocktail bar is a versatile space, the retractable roof kept firmly on in winter to create a cosy bar, but thrown off in summer for an outside drinking area. 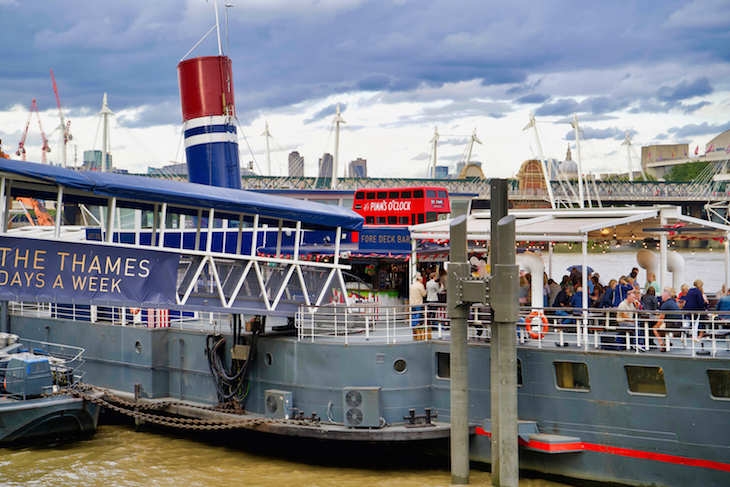 Whatever season you visit, it's surprisingly spacious, but if you want to see it in action, book onto a food and drink cruise and feel the wind in your hair as you chug up and down the canals while indulging in cheese, breads, charcuterie meats, and olives, washed down with cocktails, wine, beer, spirits, prosecco, cider and soft drinks. Alfred Le Roy features on the Club Soda Guide — a guide to help mindful drinkers seek out low- and no-alcohol drinks in London — for its top-notch mocktails. Moored up at Hackney Wick (yep, the canal's in demand around these parts), where the River Lee Navigation meets the Hertford Union Canal, The Milk Float (puntastic name...) is ideally placed for refreshments after a walk through the Olympic Park. It's a cafe and bar, so you'll find Aperol Spritz and locally-made ginger beer on the menu, alongside knickerbocker glorys. Thursday is tapas night, the barbecue gets fired up in summer, and if you're feeling fired up yourself, you can hire Moo Canoes from the venue and go for a paddle along the canal. Even with its claim to be "the best Chinese restaurant in Primrose Hill" (never mind that it's the only Chinese restaurant in Primrose Hill, eh? 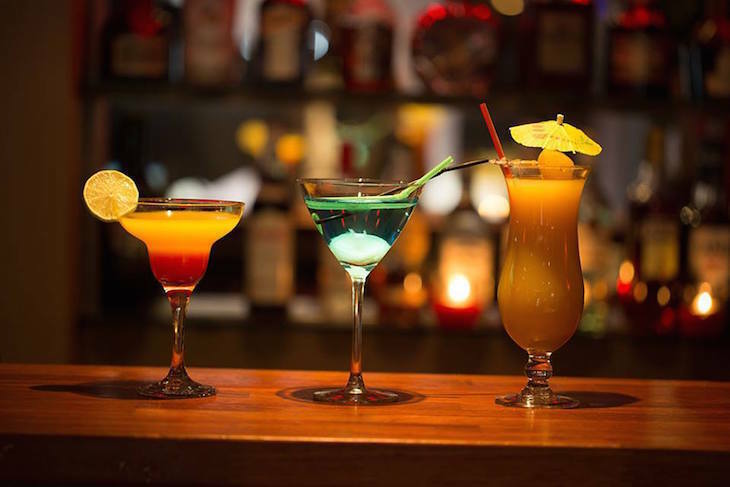 ), including Feng Shang Princess on a list of bars feels a bit cheeky, as it is predominantly a restaurant. But if we're talking floating experiences in London, it's got to be mentioned. 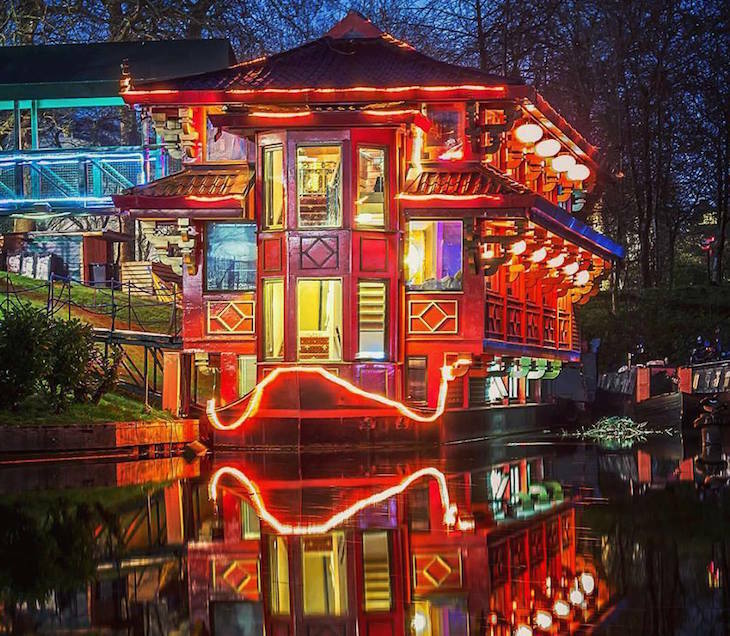 Located in the Cumberland Basin on Regent's Canal, we've witnessed canal boats mooring up alongside the Chinese temple-style two-storey boat and collecting their dinner from its windows, which has to make it the most unique 'drive-thru' restaurant in London. But back to the booze, and where Feng Shang shines is its cocktail menu, sticking firmly to the classics (think Bellini, Mojito, Kir Royale, Pina Colada). As just shy of £15 a pop, it's probably not the cheapest drink you'll ever have on a boat, but on a summer's evening, with boats pootling by on the canal, and red Chinese lanterns blowing in the breeze as you tuck into your Kung Pao Chicken, it's one of the more relaxing. 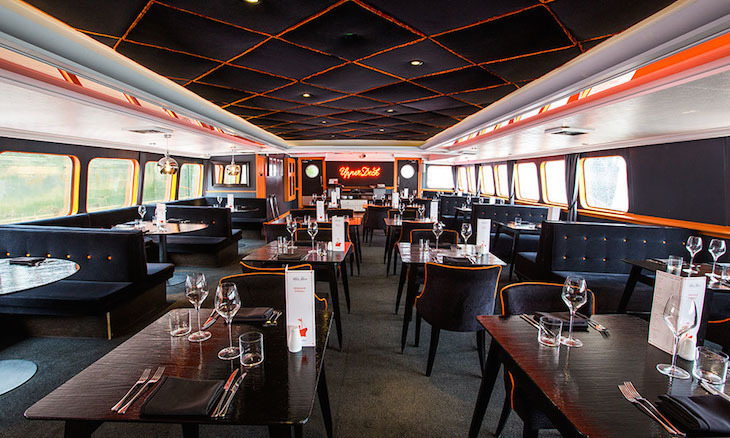 (If floating restaurants are your thing, check out the London Shell Co). 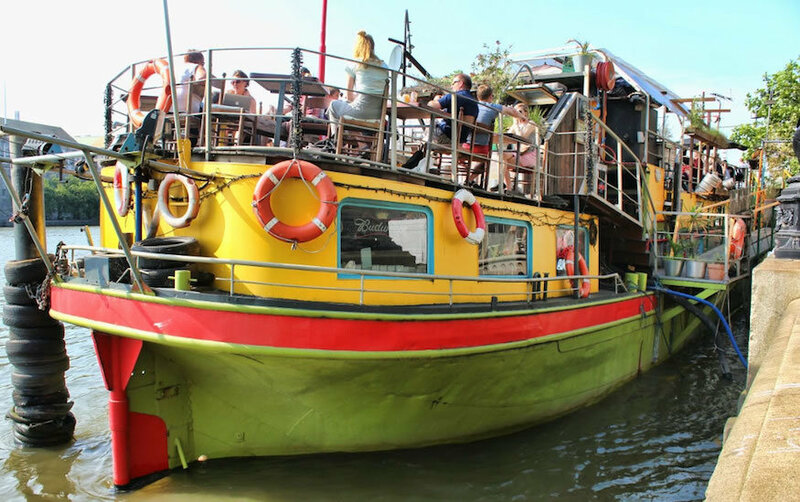 The ever expanding Daisy Green chain of Aussie coffee shops took to the water with Darcie & May Green, a pair of boats moored in Paddington Basin, overlooking the Grand Union Canal. The barges are moored up end to end, and easily identifiable by their psychedelic livery, designed by pop artist Sir Peter Blake. Darcie's your lady for all-day dining, whereas May's a go-to for coffee and cocktails.